The new Ecostar EVO series of manual two-component metering and mixing plants provide a set of new features and improvements while still coming with the proven and reliable core components of the well-known Ecostar line. The new boom features a higher flexibility in the workspace, optionally by enabling movements in two planes. The new mixing unit requires less maintenance or cleaning. Moreover, maintenance of the mixing unit is even easier now as the boom can be lowered easily. The floor space a requirement of the Ecostar EVO has been significantly reduced which makes it one of the most compact designs in the market. 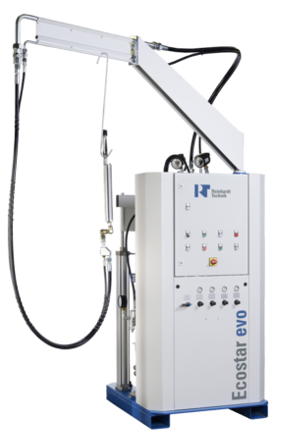 The new Ecostar EVO helps to reduce the overall manufacturing cost by increasing work efficiency through compactness, enhanced popularity with workers as well as reduced maintenance and space requirements. For processing of additional booster / accelerator materials. Comes with comfortable Ultra Mix Plus handgun. Dynamic mixer with disposable mixing chamber and two component swivel joint for integration into glass sealing plants. Optimal static mixing gun for use with piston metering systems. Comfortable and easy material filling into reusable cartridges. Providing new custom and standard turnkey systems, components, parts and repair of metering, mixing, dispensing equipment for the application of plural or single component resins, adhesives, sealants, grease and lubricants as well as service parts and equipment repair of most major brands. We have application experience in most all manufacturing fields. Success in serving the industrial, automotive, medical, electronics and other manufacturing markets with precision metering mixing and dispensing equipment. Whether you need a consistent bond, accurate electronic encapsulation, proportioning or transfering of adhesives, sealants or lubricants, or metering, our equipment offers dependable and lasting performance!